A man was arrested Wednesday on suspicion of arson and other charges in a Tuesday fire at a Palo Alto hotel, police said. 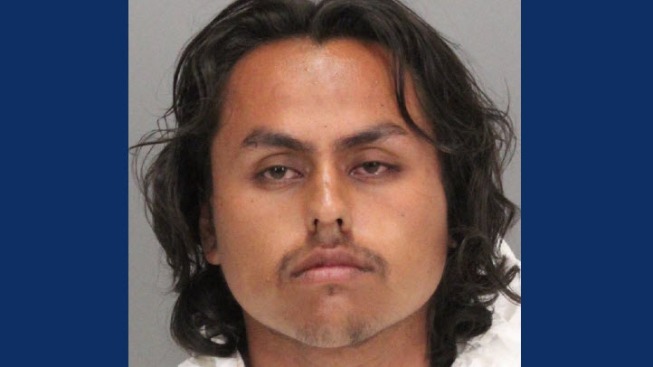 East Palo Alto resident Miguel Angel Gamero, 22, was booked into the Santa Clara County Main Jail on charges of arson, assault with a deadly weapon on a peace officer, brandishing a weapon at a peace officer, possession of methamphetamine and narcotics paraphernalia and probation violation. Police said Gamero set fire to a hotel room at the Glass Slipper Inn and later threatened officers with a knife. No one was injured. The two-alarm fire broke out just before 9 p.m. on the second floor of the inn at 3914 El Camino Real. Firefighters were able to quickly extinguish the blaze and safely evacuate all the motel guests with no injuries reported. The investigation revealed that the room had been rented by a woman in her 20s. The woman's estranged husband, against whom she had a no-contact domestic violence restraining order, was in her hotel room and started a verbal argument with her. The woman left before the argument got physical, leaving the suspect by himself in the room. She later received a call from the hotel manager informing her of the fire in her room, and she returned to the scene to meet with investigators. At about 10:30 p.m., an officer from the Mountain View Police Department happened to contact the estranged husband in the 1800 block of California Street in Mountain View. The suspect pulled a large pocket knife, pointed it at the officer and told the officer to shoot him. As other officers arrived on scene, they were able to take the suspect into custody. No injuries occurred during the arrest. Police discovered that the suspect had an outstanding felony warrant for a probation violation and was in possession of methamphetamine and narcotics paraphernalia. Upon learning the suspect was possibly connected to the fire, Mountain View officers turned the suspect over to the custody of Palo Alto detectives.